Trying to beautify an entire house with a limited budget means doing whatever we can to make the money go as far as possible. 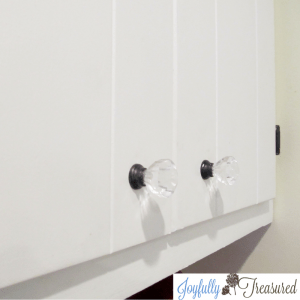 I thought of all sorts of ways to save on our kitchen remodel, and one of them was to spray paint cabinet knobs! 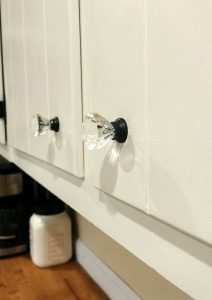 I dreamed of having real crystal knobs in an oil rubbed bronze finish something like these, but they just weren’t in the budget. Sadly, even the glass knobs in oil rubbed bronze finish were quite expensive. Post contains affiliate links. Then, I found a great price on these simple chrome knobs on Ebay. I figured I could just tape them off and spray paint them. 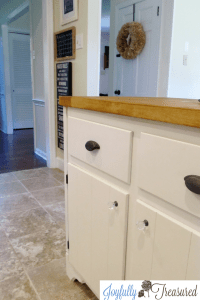 Hmm…paint cabinet knobs? For under a dollar apiece, it was worth a try! If your knobs need only need paint on the bases like mine, tape the knobs off carefully with painters tape. Next, wipe a little deglosser on the surface to be painted. Next, it is time to paint! To prevent overspray, put them in a box and spray in light coats, turning them in between each coat of paint. I used Rustoleum Universal All Surface Spray Paint oil rubbed bronze. I love this metallic paint because it has an easy spray handle, plus it is a paint and primer combined. 3. After the paint had a couple days to dry thoroughly, remove the painters tape. Jason cut the bolts down to size with bolt cutters and installed the knobs on our recently painted cabinets. At first, I tried to cut them myself, but it takes some serious muscle to cut the hardware with bolt cutters! I think the knobs look lovely. They help me put the “Chic” in my farmhouse chic kitchen. We installed them six months ago, and they are holding up very well. I couldn’t be happier with the result! 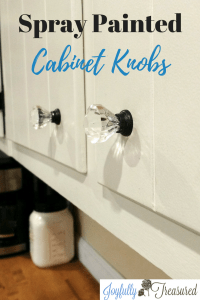 I use this same method to create crystal knob finials for my DIY curtain rods! 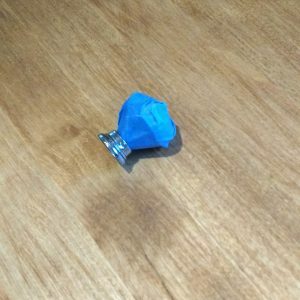 These cheap little knobs can also be found around our home on top of candle jars and diy garden cloches. I could put a faux crystal knob on just about anything…it may be an addiction. Have you spray painted anything interesting lately?